There are various types of footing can be constructed for a building. It is structural engineers’ responsibility to decide which type of foundation is to be constructed for a building. As construction professionals, our responsibility is to properly construct footings as designed or suggested in the structural drawing. In this post, I’ll show you how to construct an isolated footing for a residential building. You can do this in following 10 easy steps. 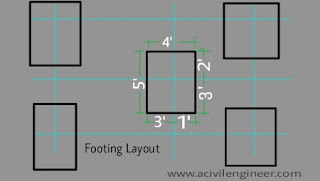 Follow the steps below to construct an isolated footing. 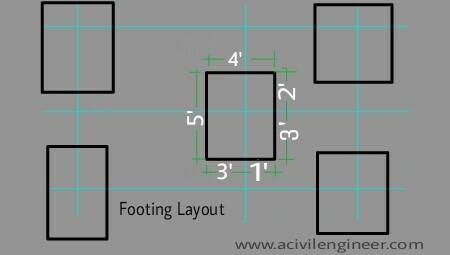 Footing layout sheet of the structural drawing shows dimension related to grid line to place the footing on the ground. See the image below. Mark the footing on the ground as shown in the drawing. Excavate a trench on earth for the footing. The size of the trench should be 1′ bigger in both sides than the footing size. In the above image, we have a footing size of 4′ x 5′. For this footing, you have to make a trench size of 5′ x 6′. It is done for placing and removing shutter easily. The depth of a trench will depend on the earth condition or suggested in the drawing. Depending on the soil condition of the base you may require to make brick-flat-soling or cement concrete at footing-base. It is also suggested in the structural drawing. Sometimes brick-flat-soling isn’t suggested in the structural drawing. If you found the base soil isn’t suitable enough to construct the footing without brick flat soling then consult with the structural designer. Make a form for the footing as specified size. You can use wooden shutter or steel shutter for this purpose. Place the form as shown in the footing layout sheet of structural drawing. Check the dimension of form and check if it is properly placed related to grid lines. Also, make the form-work leakage proof. I assume you have the required materials for the isolated footing available on the project. Cut the steel reinforcement as required sizes and provide L-bend as shown in the structural drawing. You can make the reinforcing net for the footing separately and place in footing position later or you can place the reinforcing bar directly on footing position and bind them there. One important thing sometimes not shown in the drawing is that – in which direction main reinforcement of footing should be placed – in short direction or in long direction? In footing, placing main reinforcement doesn’t follow the short direction rule. It is related to the position of the column on the footing. Read the following post to know about this. It is very important to maintain concrete clear cover not only in footing but also in all RCC members. Provide required cover block in bottom and sides of the footing to keep the reinforcing net in position. Neck column reinforcement should be placed before pouring concrete into the footing. Because neck column’s reinforcement sits on the bottom reinforcement of footing. Check again the footing and column are properly placed. Check the form of the footing is leakage proof. If everything is perfect then move to pour concrete. If the concrete volume is large or if you make several footings to cast at a time then you can go for ready-mix concrete. Otherwise, you can cast your footing with machine mix concrete. In that case, you have to order and stacked the required concrete ingredients on the job-site before. On the next day remove the form of footing. If any small honeycomb appears on footing’s surface repair those properly. If checked the formwork properly major honeycomb won’t appear. If major honeycomb somehow appeared on the footing then you have to consider breaking the footing and reconstructing. If everything is ok then fill the trench with soil and compact. Now what? I think you noticed I back-fill the footing’s trench before constructing neck column. Don’t do this. Yes. Before backfilling you should construct the neck column. If you have anything to say, write it in the comment section below. HI NICE ARTICLE THANKK'S FOR SHARING….. Excellent effort and thanks for sharing this information. After reading this informative post from you I want to read more articles from you. Keep writing informative articles. Thanks Suhas, for appreciating. I’ll try my best to write informative article. I’m feeling really good for this, Niffy. Can we backfill the trench very next day after footing & column? Or we need to cure the column and footing for some days before back filling? Yes, you can. Soil actually take care of the curing process.